Providence’s taste for corruption isn’t the only trait Rhode Island's Capitol City shares with Al Capone’s Chicago. It seems both cities disregard their acknowledged need to recycle better when it comes to events, especially road races. And each could use a waste management lesson from Seattle. This summer, the Rock ‘n’ Roll road race series made stops in Providence, Chicago and Seattle, among 24 other cities, and ecoRI News decided to see how recycling and composting for this nationwide tour were handled by a city on the West Coast, in the Midwest and on the East Coast. This coverage provides a small snapshot of the nation’s recycling and composting requirements when it comes to a for-profit business bringing a large waste-producing event to town. ecoRI Public Works was hired last summer to help handle the sorting of recyclables, food scrap and trash during the 2011 Providence Rock ‘n’ Roll Half-Marathon. Both staffers and volunteers were appalled by the amount of waste the event produced. At last year’s race, ecoRI Public Works set up dozens of three-receptacle stations, with each bin clearly marked for trash, recyclables or food scrap. These signs were often ignored. This year, our services weren’t requested nor offered, and the 2012 event didn’t include the sorting of recyclables or food scrap. A few of the people on the clean-up crew who were moving trash bags to the Gaspee Street curb Sunday morning told ecoRI News that the material in the light blue trash bags would be recycled. On closer inspection, this seemed highly unlikely, since recyclable plastic bottles and aluminum cans were mixed together with orange peels, Styrofoam cups, wooden popsicle sticks and white runners’ towels. Officials in both Providence and Chicago have failed to put practices in place that require event organizers to follow the same recycling mandates placed upon city residents. And forget about collecting event food scrap and keeping it out of landfill-bound Dumpsters. Need proof? Look at how the enormous amount of waste generated at the recent Rock ‘n’ Roll races held in the three cities was handled. 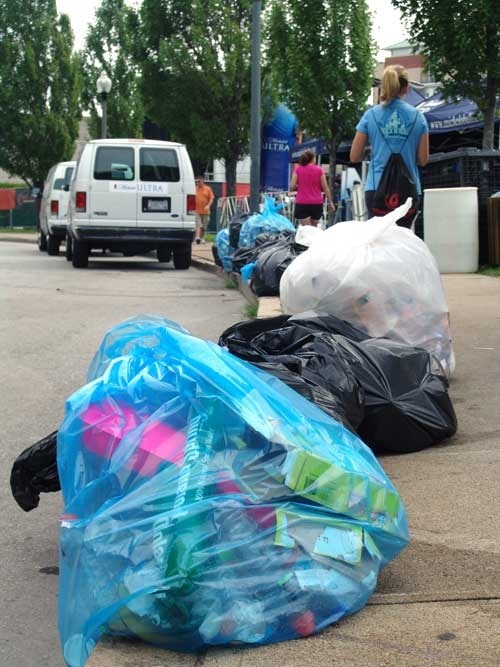 Neither Providence nor Chicago required the race organizer, Competitor Group Inc., to separate recyclables from the trash. 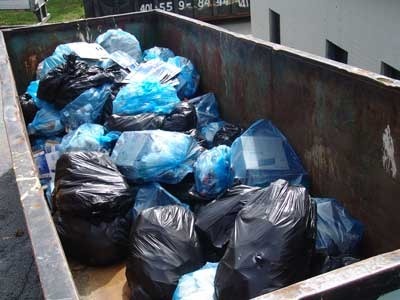 It was single-stream all the way to a landfill. In Seattle — and throughout the state of Washington, in fact — beverage vendors at events are required by law to provide recycling for single-use plastic, glass and aluminum containers. Both the start and finish for the June 23 Half-Marathon and Marathon were at Seattle Center, a sports/event facility known locally for its cleanliness, well-managed maintenance crews, and commitment to recycling and composting. Providence and Chicago may want to be progressive, but neither is. Landfill capacity at both the Central Landfill in Johnston and in northeastern Illinois is quickly vanishing, and officials both here and in Chicago have so far attempted to solve this problem by focusing on residential recycling while ignoring the business sector. The Illinois Environmental Protection Agency has estimated that there are only five years of landfill capacity left in that region of the state. When it’s gone, Chicago-area waste will need to be hauled further and further away to be buried. Here, the Central Landfill has about 23 years left, according to the Rhode Island Resource Recovery Corporation (RIRRC), which recently spent nearly $17 million on new recycling equipment. It is hoped that the new statewide single-bin recycling program dubbed “Recycle Together RI” will increase the Ocean State’s floundering recycling rate. It may, but without a serious commitment to keep event and business sector recyclables from being trashed and without a comprehensive statewide composting plan, does it really matter? Most of Rhode Island’s public school systems don’t even recycle. If the state can’t teach our students the proper way to dispose of materials, how does it expect to solve this very real problem? Rhode Island, and the state’s urban core more specifically, have been slow to embrace a big-picture view of recycling and waste reduction. In Providence, for example, officials, in an effort to improve the city’s stagnant recycling rate of 15.9 percent, recently challenged residents to do better. The six-week contest called the Neighborhood Recycling Challenge began July 30. It doesn’t, however, challenge businesses or event organizers to, as the Office of Sustainability website says, save the city money and help protect the environment. On Sunday, Aug. 19, the park between Providence Place Mall and the downtown train station was bustling with activity and dotted with white cardboard trash bins lined with black, light blue or clear plastic bags. There was no signage calling for recyclables to be put in this bin or trash in that one. Recyclable aluminum cans and plastic water, sports drink and chocolate milk bottles shared these bags with wet runners’ towels, popsicle boxes, plastic wrapping and compostable banana peels. These different colored bags were then tossed together into a Dumpster. Monday morning, commuters headed to the train station, Providence Place Mall or the Statehouse were greeted by a park littered with empty cardboard boxes, 12-ounce aluminum beer cans, assorted sizes of plastic bottles, a tattered cardboard box overflowing with clothes hangers, untied bags of trash, a pallet of broken-down cardboard boxes, three Chipotle veggie burritos wrapped in aluminum foil and a box of flattened plastic water bottles that, even if they were destined to be recycled, wouldn't be, because the RIRRC's new sorting machine considers flat items to be paper. A crate of perfectly edible oranges and a 12-pack of unopened bottled water sat in a Dumpster, and a failed composting project in a far corner of the train station lawn featured bacon, salad greens, buns, brownies and home fries either left on the ground or left in an aluminum tray that was left on the ground. Providence has no requirements for recycling or composting at outdoor events, even for regular happenings such as WaterFire. The San Diego-based company that organized Sunday’s road race wasn’t required to recycle or compost. Sheila Dormody, the city’s first director of sustainability, said both are on her long list of environmental objectives. At the moment, though, any effort to collect food scrap, and plastic water bottles, cardboard and other recyclables at such events is strictly voluntary, said Dormody, who has been on the job for less than a year. 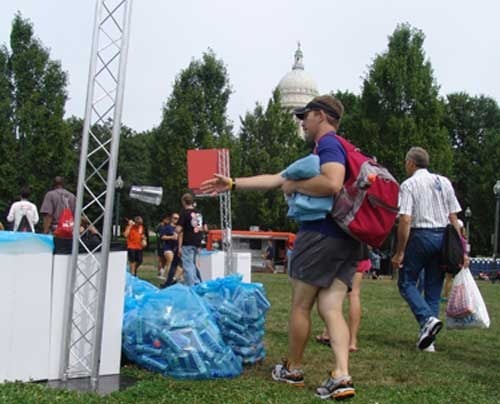 The RIRRC offers recycling bins and recycling Dumpsters at no cost, including delivery, for large waste-intensive public events, such as for-profit road races. 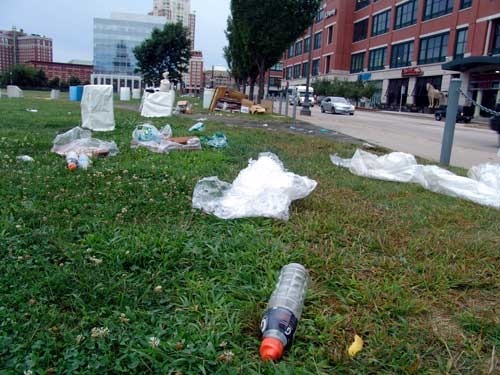 Yet, according to Providence’s Environmental Sustainability Task Force, it would prefer that event organizers comply with recycling laws — the ones residents have been challenged to better obey — voluntarily. It’s also the right thing to do, and requiring event organizers to recycle and collect food scrap won’t spoil the fun. 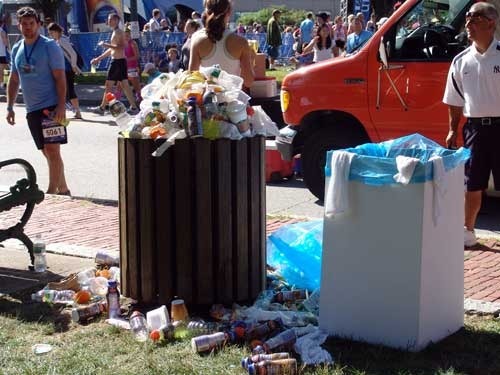 The Providence Rock ‘n’ Roll Half-Marathon, for instance, would still be an enjoyable, inspiring and profitable event even if Competitive Group was forced to recycle and collect food scrap. In fact, at least a few of the 5,000 or so runners asked clean-up crew members if there was a bin for recyclables. If an investigation of a Chicago backyard compost pile is warranted, a sample of the compost will be collected and hand-squeezed. “If water drips or trickles from the squeezed sample, but does not drip from the sample without squeezing, and the sample maintains its shape upon release, the moisture level is within” allowable limits, 40 percent to 60 percent. No city official was on hand during the July 22 Chicago Rock ‘n’ Roll Half-Marathon hand-squeezing the event’s compostable food scrap that was being tossed out with recyclables. As the Chicago event wore on, and more and more of the 20,000 runners crossed the finish line, participants loaded up on Chobani yogurt and chocolate milk. 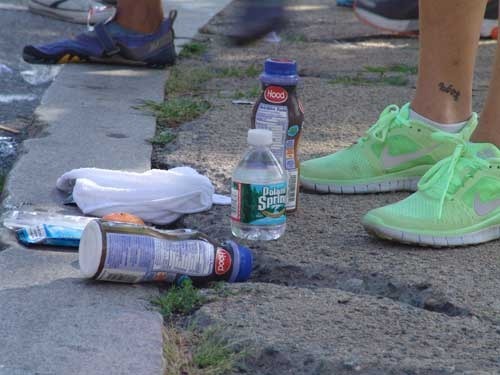 By 10 a.m., the trash receptacles on every street corner in the vicinity of the race were overflowing with banana peels, plastic water bottles and Styrofoam cups. Nothing was being separated, and the clean-up crew was having trouble keeping up with the high volume of waste. Crews worked long after the race and after-party had ended, picking up the lingering mess left behind by others. Unfortunately, all of it ended up buried in northeastern Illinois. “One of the easiest things we can all do to improve our environment is to recycle wastes whenever possible. Recycling saves natural resources and energy and reduces the need for landfills or incinerators,” according to the Illinois Environmental Protection Agency website. Like Rhode Island, that responsibility is expected of residents only. Commonsense environmental practices, which recycling and food-scrap collection certainly are, can be part of a road race, festival or concert without taking away from the event’s enjoyment or experience. It just takes some initiative, some forward-thinking laws and a will to make such practices part of a community’s culture. Just look to the Pacific Northwest for some inspiration. In Seattle, where the June 23 Rock ‘n’ Roll race drew more than 22,000 runners and featured both a half-marathon and a full-marathon, the environment wasn’t sacrificed for the sake of an event. Recyclables, such as numerous plastic water and sports drink bottles, and compostable cups were kept out of Washington’s waste stream, and, according to ecoRI News' Seattle correspondent, there was an overall lack of litter throughout Seattle Center before, during and after the event. The same can't be said for downtown Providence following its hosting of the event. For the event, Seattle Center brought in more staff and added extra waste, recycling and compost bins. In the center’s lawn areas and open spaces, there were three receptacles every 30 feet — each triad had separate waste, recycling and compost bins, all marked with signage — and large Dumpsters, for waste and recycling, every block. But even the Emerald City fails to make food-scrap collection mandatory during events, although Seattle residents can place food scraps and food-soiled paper in their city-provided food and yard waste cart that is emptied curbside. And Seattle — like Rhode Island with businesses that ignore the state’s recycling laws — is guilty of inadequately enforcing recycling and composting mandates. Since July 2010, Seattle law has required food-service businesses, including food and beverage vendors at events, to use compostable or recyclable food packaging in place of disposables such as expanded polystyrene, better known as Styrofoam. 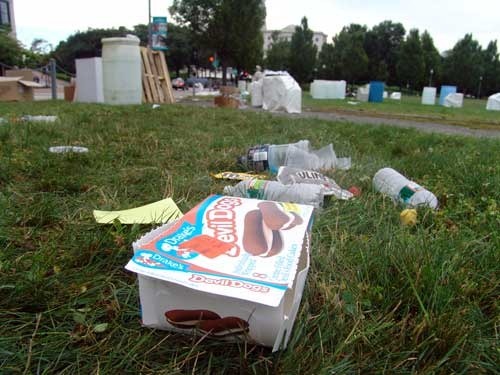 Despite that law, which carries with it a $250 fine for each violation, Styrofoam Jamba Juice cups littered Seattle Center and the surrounding area June 23. Recycling and composting food scrap do all that and more, but these initiatives don't work unless programs are put in place and laws enforced. Erika Johnson from Chicago and Greta Wilson from Seattle contributed to this report. ecoRI News staffers Tim Faulkner and Joanna Detz also contributed to this report.